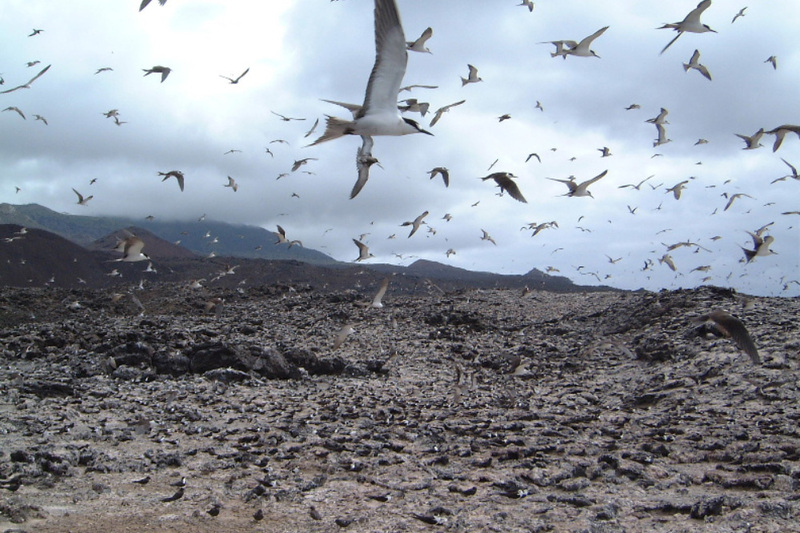 The observed population crash in a Sooty Tern colony located on Ascension Island, one of the UK Overseas Territories (UKOTs), is partly due to poor diet, research led by the University of Birmingham has found. The most numerous seabird of tropical waters, Sooty Tern is an abudant species. The colony on Ascension Island is the largest in the entire Atlantic Ocean. However its population has declined from several million in the middle of the last century to just a few hundred thousand today. A team based in the University's School of Biosciences believes the birds' plight is closely linked to changes in populations of predatory fish, such as tuna. The terns follow these large fish across vast expanses of ocean to feed on the small fish driven to the surface as they hunt. An adult Sooty Tern feeds its chick on Ascension Island (Dawn Osbourn). The terns had been expected to benefit from conservation work carried out on the island between 2002 and 2004 by the RSPB. 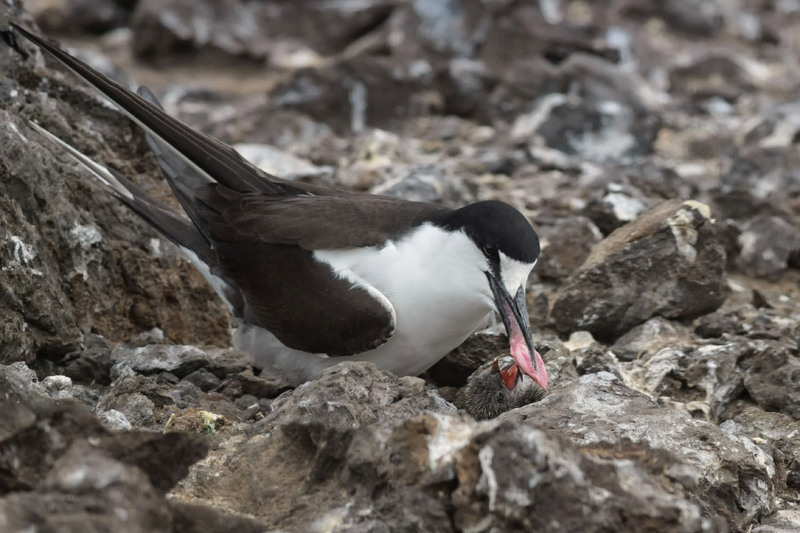 This involved a feral cat eradication scheme in a bid to restore nesting populations of seabird species, including the rare Ascension Frigatebird. However, while many seabird species subsequently began to thrive, the tern population did not recover as expected and the Birmingham team, together with researchers from the University of Exeter, the Ascension Island Government Conservation Department (AIGCD) and the Army Ornithological Society (AOS), set out to find out why. Dr Jim Reynolds, lead author on the paper, commented: "We believe that a number of factors might influence the size of the breeding population of sooty terns on the island but we wanted to understand such factors in greater detail, resulting in causal explanations of the tern population decline over the past 60 years." The team started to look at the birds' diet after noticing that some of the food naturally regurgitated by the terns contained lots of prey low in nutrients, such as squid, marine snails and even locusts. To find out more, they started to search museum databases to find Ascension Sooty Tern specimens held in museum collections across the world. Feathers from these specimens can be analysed using mass spectrometry techniques to reveal clues about what the birds were eating. Feathers from more than 180 specimens, dating from 1890 to the present day, were collected and analysed by collaborators at the University of Coimbra, Portugal. The results clearly showed that a change in the terns' diets from eating mainly fish to eating lower quality food was coincidental with their population decline. Despite big declines, large numbers of Sooty Terns still breed on Ascension Island (AIG Conservation). "There are several factors that could have led to the terns eating less fish," explained Dr Reynolds. "Part of the answer will lie in the rapid growth of industrial fishing for species like tuna over past decades – but ecosystems are complex, and other forms of global change, such as the warming of the oceans may also play a significant part in this story. As oceans warm, the movements of top predators and the fish on which they forage are changing, possibly making it more difficult for the terns to follow them in search of food." He added: "This is a complicated story that shows just how fragile and delicate the marine ecosystem is. Our findings strongly reinforce the need for a large marine reserve where it would be possible to police fishing more effectively and do much more to protect these vulnerable species." Dr Sam Weber, a co-author from the University of Exeter, added: "Seabirds are often regarded as sensitive indicators of the health of marine ecosystems – or 'sentinel species' – so the findings of this study could be seen as a bellwether for broader ecological challenges facing the tropical Atlantic. Marine protected areas such as that planned for Ascension Island may well help to alleviate pressure on species like Sooty Tern. However, restoring healthy marine food webs across the vast areas over which these birds roam will ultimately require a fundamental shift in the way we think about, and manage, the world's oceans, including in high seas areas beyond national jurisdictions."